Busher agrees with Price’s assessment and solution. The city’s solution — the installed traffic light — is not the standard color-coded signal. Rather it is one called a High Intensity Activated Crosswalk beacon. Instead of being changing colors at programmed intervals, HAWK lights are activated only when a button is pressed. 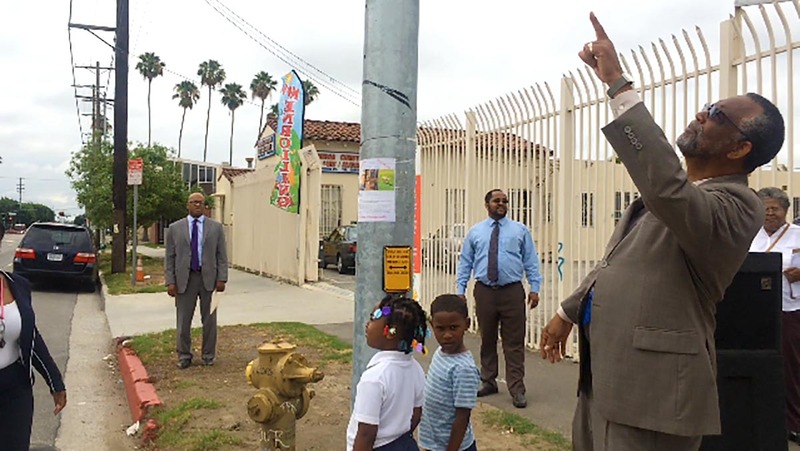 Work to install a traffic signal at the wide intersection began more than a decade ago when Charles Cline, a community advocate and church member at the Figueroa Church of Christ, said a churchgoer was hit by a car and broke his leg. 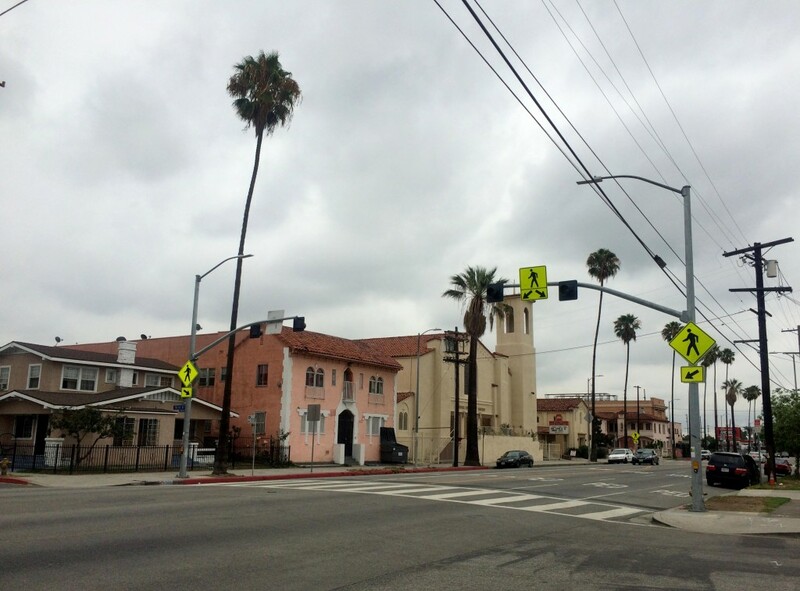 Angela Johnson, an employee at Figueroa Senior Housing locates at the Northwest corner of the intersection, said she’s seen a few accidents in her time at the center. The most recent, she said, was about a year ago. At the intersection, Cline said the elderly patrons of three particular buildings have long called for a safer crossing. 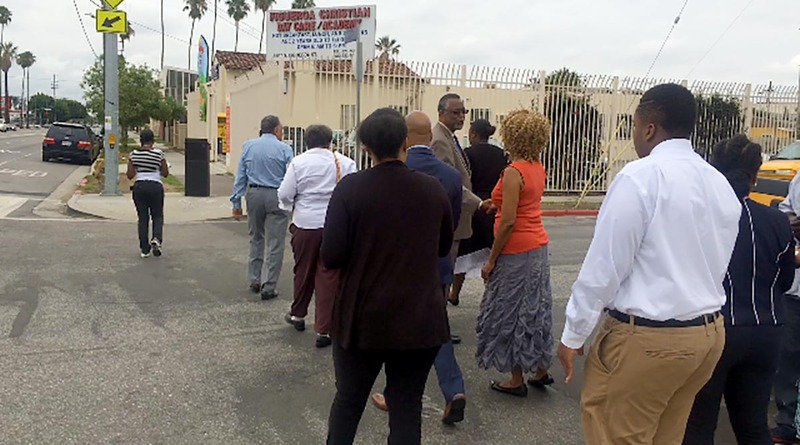 With the church located on the southeast side of the intersection and both the daycare and senior housing across the street from it, a large number of vulnerable seniors and young children frequently cross the street. Despite the situation, it took more than 20 years worth of effort to convince the city to approve the installation of a signal, residents said. Compounding the issue, Cline said that this intersection that sits near Harbor Freeway ramps experiences traffic congestion whenever the interstate is closed. The councilman, who has overseen the district since 2013, said solutions to the district’s most pressing concerns come from regular communication between him and residents. Peggy Hill, a community and church leader alongside Cline, expressed her thanks to the councilman and his office after Price’s speech. She noted that it goes a long way for a city councilmember to answer phone calls and make frequent appearances in the community. During his speech, Price asked for two volunteers from a small group of children from the daycare to help him press the button for the first time. Moments later, bright yellow lights flashed pedestrian crossing signs, indicating to drivers to stop for foot traffic. “Old habits die hard, I guess” Price replied. Senior community members decided to give it a shot anyway, slowly crossing the street, linked arm in arm, as the lights continued to blink. On the corner, Busher who had paused for the ceremony after dropping her daughter off, watched on. Asked if she felt safer, she squeaked out a yes, clarifying that she felt more secure as a pedestrian. “At least now drivers know if they don’t stop, it’s their fault,” Busher said, gazing at the busy intersection she had shuffled her daughter across so many times before.